At the time of reviewing the Shark Rocket TruePet with DuoClean (HV382) is the #1 bestselling ‘pet’ vacuum on Amazon. But is it worthy of that position? The first thing to say is that this vacuum has something of an identity crisis. This looks and acts like a stick vacuum but it’s in the top 5 bestseller Upright Vacuums on Amazon. What matters is not what category it belongs to but how well it performs. The Shark Rocket HV322 has been one of the most popular vacuums in the mid-price range for the last few years. And while that cleaner was successful I think the Shark Rocket Truepet with DuoClean is set to do even better. The one thing that stands out about the Shark Rocket TruePet with DuoClean is just how versatile it is. 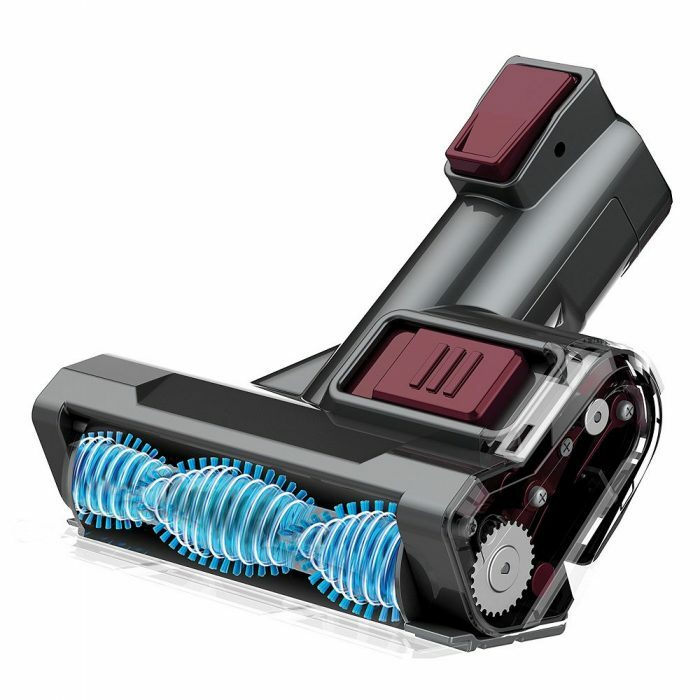 This vacuum is a convertible, with the top handle section unclipping to form a handheld vacuum. Whatever you need to clean, wherever you want to vacuum, this cleaner can handle it. Carpets, rugs, hardwood floors? Piece of cake. Bookcases, ceiling fans, curtains, couches, mattresses, this cleaner will help you do the lot without breaking a sweat. 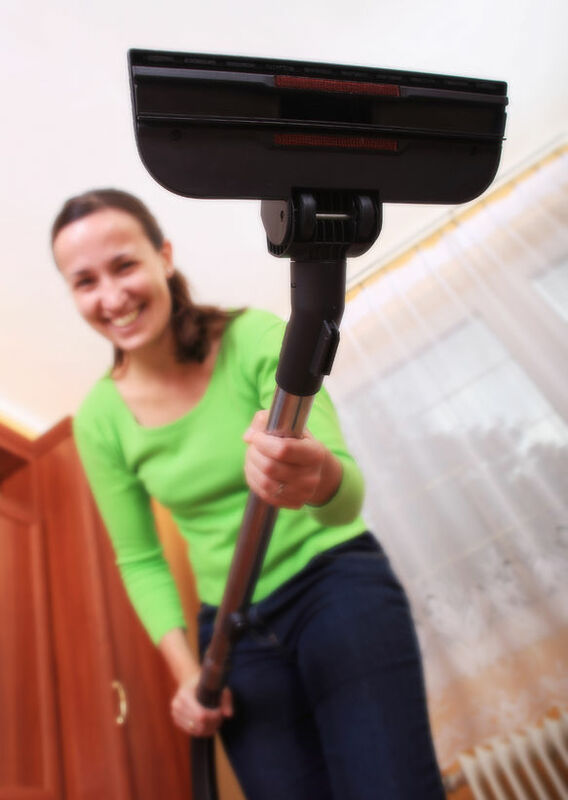 You might be exhausted – the handheld component is quite large – but the vacuum will be fine. Ever heard of Triple Particle Cleaning? Me neither. But obviously, the people at SharkNinja decided they needed a catchy way to tell us that this vacuum can pick up 3 types of particles – large pieces of debris, small pieces of debris and stuck on dirt. That’s great but the real innovation over the old HV320 series is the new brush-roll set up. As well as coming up with a new name for cleaning, the marketing department have given us this useful graphic to show us what’s going on. There are now 2 brushes that work together to extract more of the dirt and debris from your floor. The soft brush at the front attracts small particles while the stiff bristle brush behind it dislodges and grabs the larger pieces of dirt, sending them straight into the vacuum airflow. But how well do these brushes pick up dog hair? The Shark Rocket is a little hit and miss in this department. The 2 brush system is clever and the vacuum is fine picking up short hair. But long dog hairs quickly get wrapped around the roller and need to be detangled. You can access the brush rollers easily without having to turn the vacuum upside down. And there’s a little tool stored near the rollers to help you clear the hair out. This is probably not a great vacuum if you have a dog with long hair. The vacuum weighs 9.9 pounds which is light for an upright. But it’s not the overall weight that is the issue for some. It’s the way the weight is distributed. The motor is in the handle – this is the unit that unclips to become handheld. This makes the vacuum feel top heavy. The handle unit alone is 5 pounds, which for most people will be no problem but anyone with back or other muscular problems might struggle to cope with this weight. The handle itself has been ergonomically designed and does feel very nice to hold. 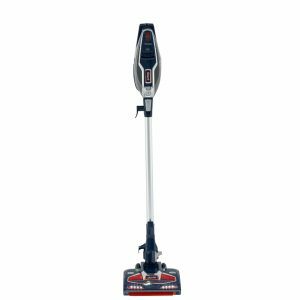 This combined with the swivel steer mechanism, makes it easy to maneuver this vacuum. The LED lights on the front of the cleaner make it look very futuristic and make it much easier to spot dirt and dog hair you might otherwise have missed in dark corners. And the vacuum lays almost completely flat, making it easy to vacuum under coffee tables, beds etc. The Shark Rocket DuoClean comes with the same 30ft power cord length as the old HV320 series to give you plenty of freedom to clean and minimise the number of times you need to switch plug sockets. Obviously, this depends on the layout of your home but I can do 4 rooms from one hall socket. 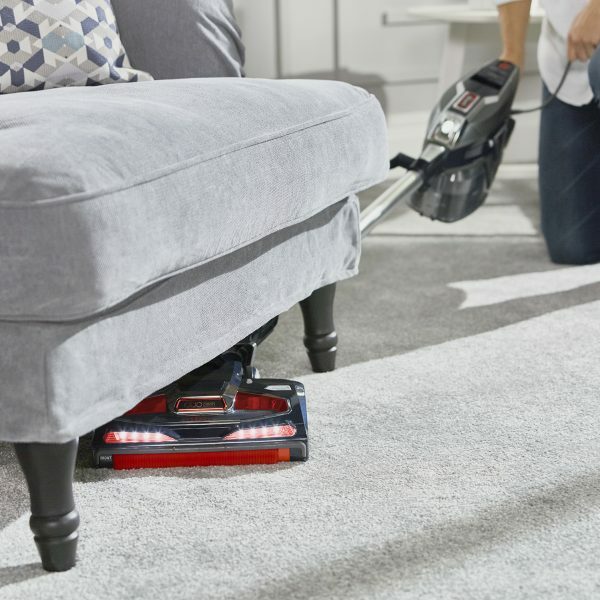 Another time saver is the speed at which you can switch from upright vacuum mode for large areas to handheld vacuum mode for upholstery, stairs or those awkward to reach spots. No attaching hoses and tools with this cleaner. Simply unclip the handheld section and you’re good to go. As mentioned before the handheld unit alone weighs 5 pounds so it will get tiring for some people using it for any length of time and you’ll probably find you’ll have to use both hands. 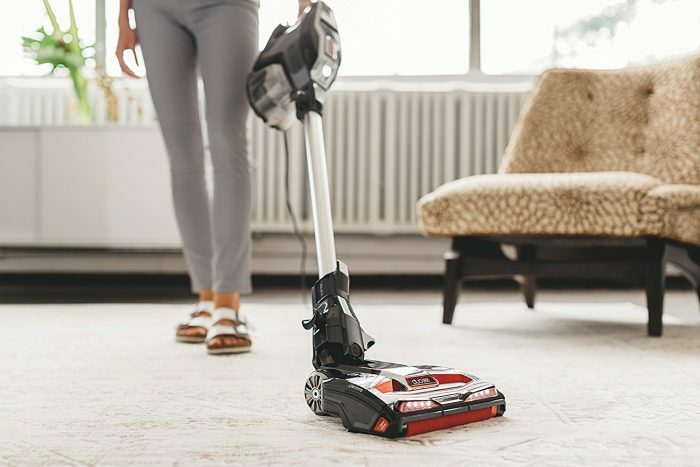 You’ll probably find you’ll need to switch to the handheld unit to clean around the edges of the carpet as the vacuum won’t clean right up to the baseboard. One thing that disappoints many who buy this ‘upright’ vacuum is that it doesn’t stand up on its own. To be honest I wasn’t expecting it to – after all it is basically a stick vacuum. And, like many stick vacuums, it comes with its own wall mount so it takes up minimum storage space when it’s not being used. You just need to look at the design of a Shark Rocket to know that there isn’t a whole lot of dirt capacity – 0.25 gallon cup to be precise. There’s always a trade – off between how light a vacuum is and how much dirt it can hold. You buy a Shark Rocket because you love the ease of use and flexibility. The compromise is that you’ll need to empty it a little more often than you would a vacuum with a standard cylinder. As I mentioned at the top of this review, the Shark Rocket with DuoClean can clean pretty much anything, thanks to its switchable handheld mode. 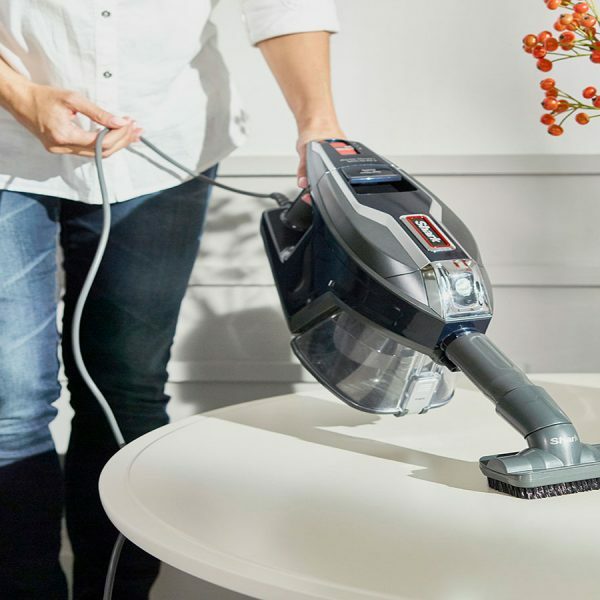 The 600-watt motor generates powerful suction and you can vary this suction power depending on the surface you’re cleaning. If you’re cleaning a hard surface you can use the first setting. And for thick pile carpets you can switch to setting 2 to turbo charge your suction and clean deep down into the pile. This vacuum works very well on hard floors. And there’s no worry about your lovely hardwood floors getting scratched. The second, stiff roller brush is slightly raised so doesn’t come into contact with a hard floor. If you buy the HV382 complete version you’ll get the accessories you’d expect – a dusting brush, a crevice tool and an upholstery tool. But it also comes with a few other tools that make cleaning even easier. First there’s the TruePet Motorized brush, which is very effective at dislodging and removing pet dirt. You also get a special very long ‘under-appliance wand’ for cleaning those places that are otherwise impossible to vacuum. And in addition to the standard dusting brush you get a multi-angled dusting brush, for reaching other hard to get at nooks and crannies. And they give you an accessory bag to put all these tools in! If I have one criticism of all the Shark Rockets it’s their filtration. There are 2 regular filters – one in front of the motor and one after it. One is made of foam and the other is felt. They are washable and you will need to wash them regularly to keep them effective. The filters work perfectly well (if kept clean) but I’m disappointed that such a high-quality cleaner doesn’t have HEPA filtration, particularly given they are aiming this cleaner at pet owners. On the plus side the Shark Rocket TruePet with DuoClean is a very versatile vacuum. It enables you to clean all floor types and with its assortment of tools it even gets into nooks and crannies other vacuums can’t reach. It’s very good at picking up short pet hair but longer hair gets snagged on the roller. This is easily removed but in our opinion this cleaner probably isn’t a great choice if you have a dog with long hair. The filters on the Shark Rocket are very good but if you are concerned about pet dander or other allergens you may want to consider a cleaner with a HEPA filter. The Shark Rocket TruePet with DuoClean vacuum is a great choice if you have a dog with short hair, want a lightweight, versatile vacuum and aren’t concerned about having a HEPA filter.